This is a card I made last week for a very special lady I work with. My friend is always offering to help others with their work and she is a kind, smiling, tireless, hard-worker and all round great person. We couldn’t do without her! Anyway, the week before she had done something extra out-of-the-way for me and I simply had to acknowledge her kindness with a card. And this is it! 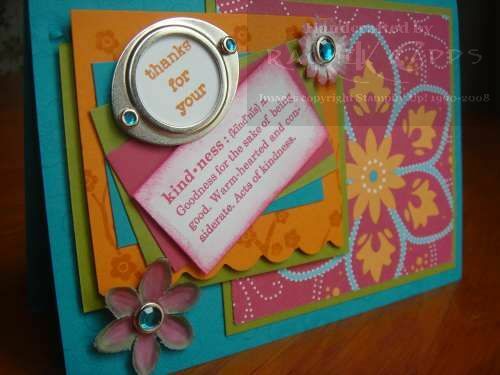 The colours I used were inspired from a colour challenge run by Alana Gallagher from The Inklings cyberstamp. They are Tempting Turquoise, Pumpkin Pie, Old Olive and Rose Red. The new Bali Breeze DSP fitted perfectly into the colour challenge! This is a close-up of the Styled Silver hodgepodge and rhinestone brads I used … the Styled Silver just lifts a card from wow! to WOW! Don’t you think? The stamp sets I’ve used are Life Definitions, Everyday Flexible Phrases and tucked away as stamped backgrounds on the Pumpkin Pie and Tempting Turquoise papers you’ll see a tiny bit of Eastern Blooms from the Summer Mini too! The countdown to Christmas is on! 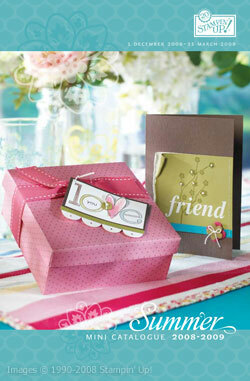 And the new Summer Mini Catalogue from Stampin’ Up! began on 1 December 2008 and is available until 31 March 2009. If you would like a copy, then email me today and I’ll post a copy to you (in Australia). If you would like to view it online, then you can click here. 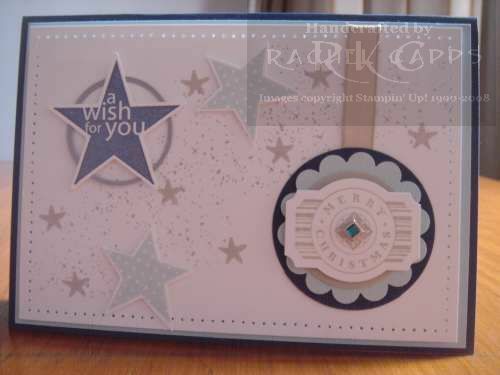 This is one of the cards I’ve made from the new stamp set, In the Stars (page 14). I think this stamp set is so versatile … it makes Christmas cards, birthday cards, baby cards, congrats cards … your imagination is the only spark it needs! 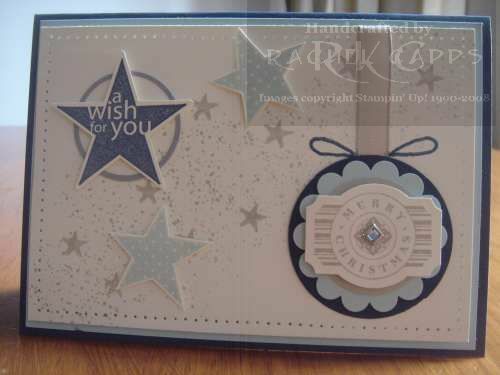 I made this card using the colours Night of Navy, Soft Sky, Silver and Sahara Sand. The card above I didn’t make the bauble with a bow … the card below, I used my Night of Navy marker pen to create a bow … which do you prefer? Bow or no bow? ?